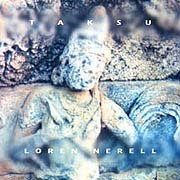 On Taksu (69'18"), Loren Nerell turns in an epic masterpiece of ambient music steeped in the legends and landscapes of Indonesia. The album draws equally from the region's cultural richness and intensely beautiful countryside and aspires to represent the integration of a living breathing art, people and land. 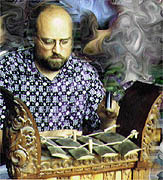 A continuous piece, Taksu is less a re-creation of actual traditional forms of gamelan composition than it is Nerell's own free-form adaptation. The lengthy and immersing soundscape is built up out of a collage of ambient sounds, but surpasses the mere anthropologic or geographic ethnicities of conventional albums of Indonesian music through its integration of technology (synthesizers and samplers) somewhat outside of the tradition. A diffuse and continuous synth drone flows through this entire soundworld. Barely perceptible at first, methodically executed metallic tones are introduced and become more prominent throughout the piece's slow evolution. But what animates Taksu, and gives this album its strong sense of place, are the wonderful location ambiance recordings. These exquisite field tapes are mixed in with the layers of humming synths to intensify the main effect of the piece yet remain on the fringes of perception - providing Taksu with its palpable atmosphere. This is classic ambient music but with an undeniable connection to the realms of Indonesia - including its mental, physical and mystical states. Taksu is a vital hi-tech ceremonial performance - First World music of the 21st century.